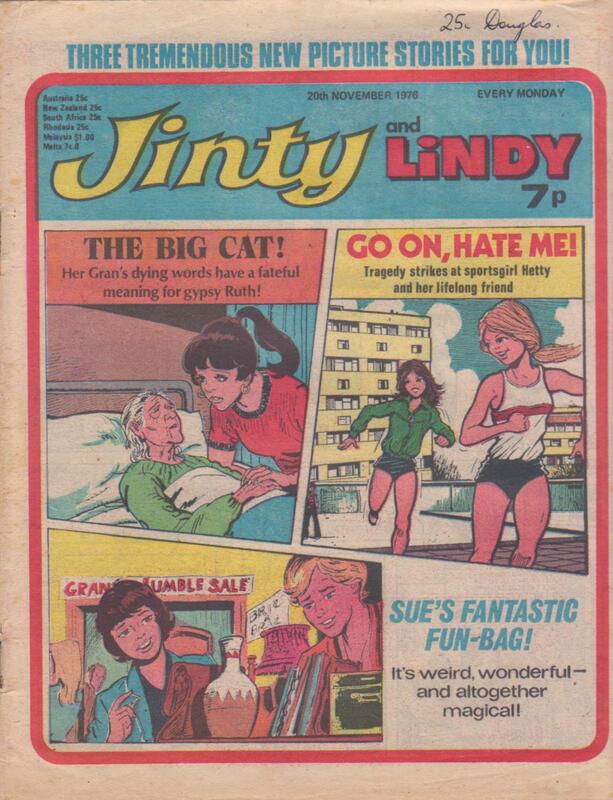 This issue marks the debut of one of Jinty‘s most popular humour strips, “Sue’s Fantastic Fun-Bag!” This strip would run for three years, arguably longer than The Jinx from St Jonah’s and Dora Dogsbody. Sue sees a handbag (brought back from the mysterious Orient) at a jumble sale and just has to have it. It seems that the handbag, which Sue names Henrietta, seems to be grinning at Sue, but Sue has no inkling of what she has bought just yet. But we do when a thief snatches the bag with the takings. He takes a comb out of the bag and when he uses it, he is astonished to find his hair growing to monstrous proportions and then wrapping around a pole. He ends up begging a policeman to arrest him. Sue takes back her bag, not noticing its mischievous grin. An interesting approach to the first episode, where we’re not told everything at once, but we have been given enough to have us eager for the next episode. “Rose among the Thornes” is reaching its climax, with an unexpected twist that could backfire on the Thornes. A canister fell from a plane and wrecked gran’s cottage, which gives them the excuse to pull it down. But they don’t realise the canister contains a dangerous toxic chemical and it is leaking! Rose is on her way to warn them, and it is the race of her life. Stefa gets even more daft with her heart of stone. Dad threatens to get rid of her statue, so Stefa runs away – with the statue on a wheelbarrow! You just have to laugh, and of course Stefa can’t get far when she is carrying a statue along. 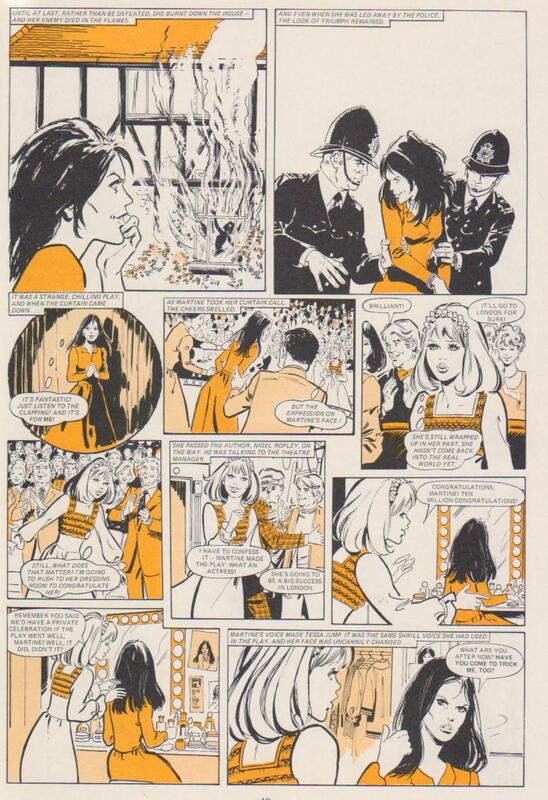 Mario Capaldi (1935-2004) is an odd case of a key Jinty artist. 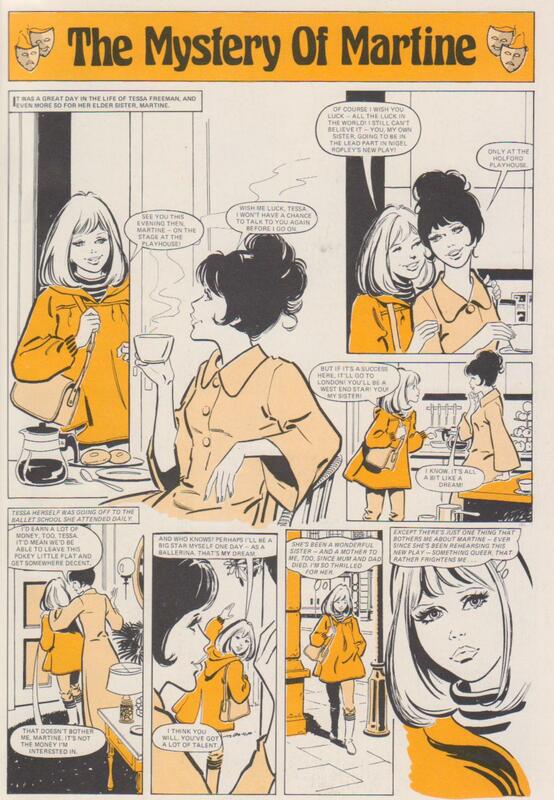 He had a uniquely visible position as a long-term cover artist during not just one but two time periods, strongly setting the visual identity of the comic. Like fellow British artist Phil Townsend, Mario Capaldi had a very solid style, strongly grounded in the day to day world around him; his covers nevertheless show that he was well able to draw a wide range of sports that will have required research and imagination. However, when you come to tot up the comics stories that he did over that time, it is not as substantial a body of work as you might have thought. Despite that, he is clearly one of the key artists of this title. 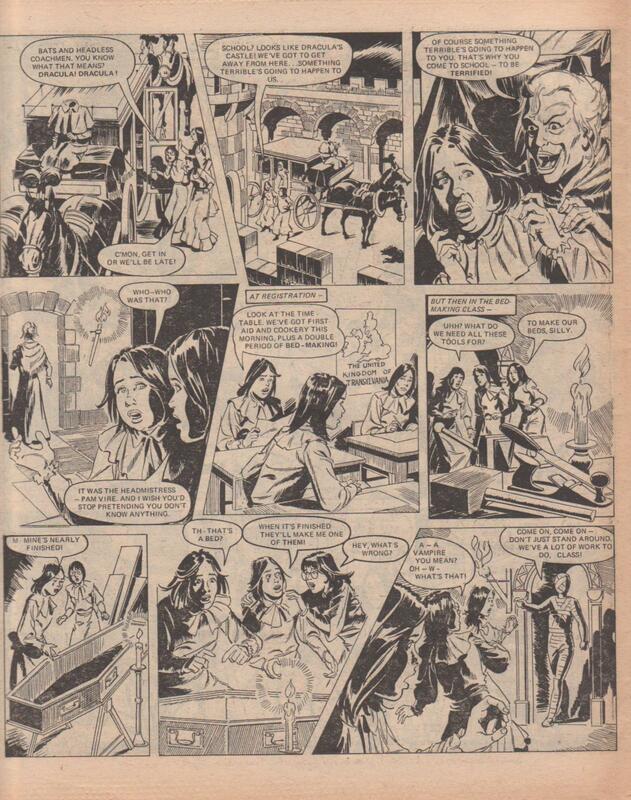 He started off his time at Jinty drawing “The Jinx From St Jonah’s“, which from issue 4 occupied a prominent position on the cover almost every week. 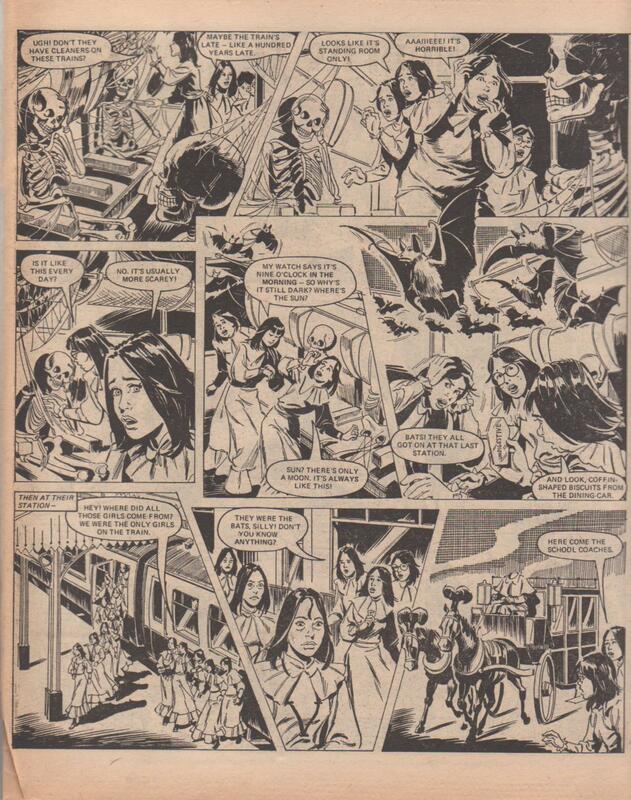 The cover page was nominally a page of comics in that it showed a sequence of two or three panels, but the big focus was on the splash image, a very dynamic drawing of Katie Jinks typically in the middle of some pratfall or other. This continued until the time of the Jinty & Lindy merger in November 1975. Mario Capaldi continued drawing the story for a while longer but by the middle of 1976 this too had come to an end. That wasn’t the end of Capaldi’s work in Jinty, but he didn’t appear again regularly for some years. 1976 saw him start a stand-alone story (“Champion In Hiding”) but without finishing it: it was completed by another artist. (“Jinx” had also had episodes continued by other artists, but this is not as surprising for an ongoing humour strip with no fixed end point as it is for a story that will typically not last for much longer than four months or so in any case.) 1977 saw him start and complete another stand-alone story, “Cursed To Be A Coward!”; not one of my top picks, but handily proving he could pull off creepy just as well as zany. His return to the pages of Jinty does follow quite nicely on the heels of Misty‘s merger with Tammy, so I could well imagine that’s not a coincidence. 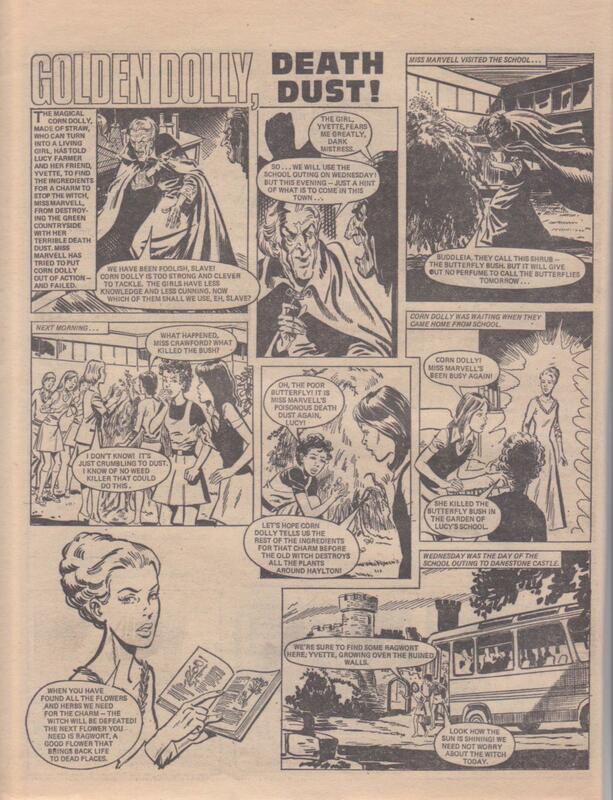 He then drew a couple of key stories for Jinty – one of Mistyfan’s favourites, “Dracula’s Daughter“, and one of my favourites, “Life’s A Ball For Nadine”. It is his cover images, though, that will be a particular part of many Jinty readers’ iconic memories of the title. His daughter, Vanda Capaldi, has more information his life and artistic development. She also wrote an article specifically for the Misty fansite (currently down, hopefully will return shortly). Continuing from the previous WTFometer post, here are some worked-through examples. “Song of the Fir Tree” is not a fantastical story, but it is one that takes the reader quite far away from their usual context. There’s not just one girl protagonist but two, of mixed gender (the major focus is on Solveig, but her brother Per gets a lot of lines, action, and attention too). The story is set in Continental Europe, not very long beforehand but in a definite historical period compared to the readers of the time; and the children are more than poverty-stricken: they are in serious danger of starvation and of death by murder or by accident. In the absence of family, they have to make their own decisions and way all across many countries; this is all without special abilities like that used by “The Robot Who Cried” or Xenia in “Almost Human” when they also trek far distances. 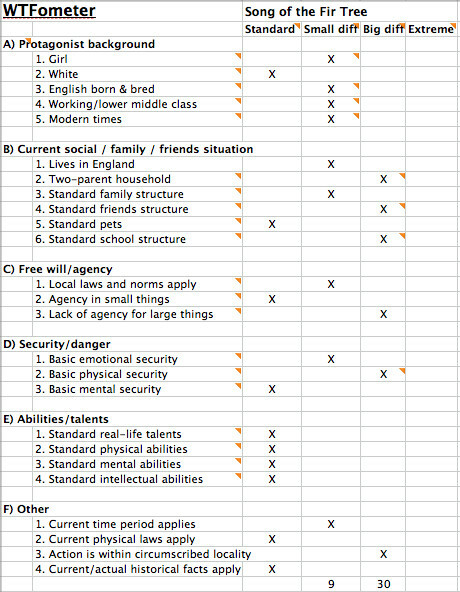 I am experimenting with giving the stories scores on the WTFometer – a small score on a measure means that the difference (positive or negative) compared to the default is likewise small – a boy rather than a girl, but not an animal or an alien. A score in this column counts as 1 point. A big score on the measure means that the difference (whichever way it goes) is larger – their basic physical security is not just compromised to the extent of a broken leg or a hospital stay, but seriously enough to endanger their lives. I am scoring these as 5 points, to give extra weighting accordingly. And an ‘Extreme’ score? That scores 10 points, and represents a protagonist death, or a school structure so different from the default to seem unrecognizable, or physical laws so warped to allow for just about anything. “Children of Edenford” is surprisingly tamer than I might have expected. Well, no, not tamer, but… more concentrated in its focus? Much of the set-up in “Children” is going to be very familiar to the readers. Patti is a girl much like the expected average reader: white, English, with parents who both work either to earn a living or to keep the house. The school, however, is very definitely out of the ordinary, and the contrast is the sharper for it; the same goes for the coercion and mind-control, so strong that it borders onto magic. 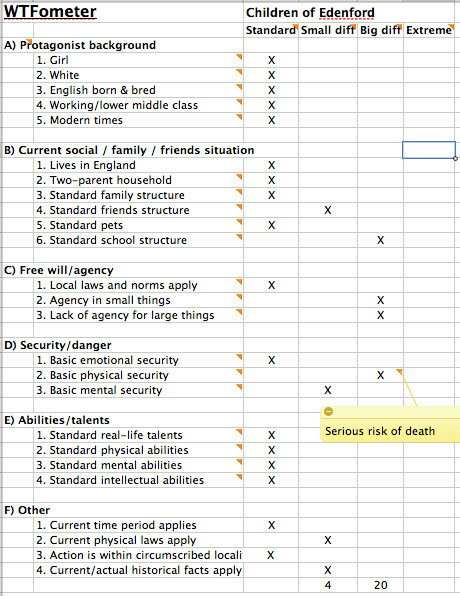 (Perhaps I should have scored ‘agency in small things’ in the Extreme column to show this?) This is a case where I would really like to do a comparison of the early episodes with the later ones, to show how the departures from the average become more marked as the story develops. 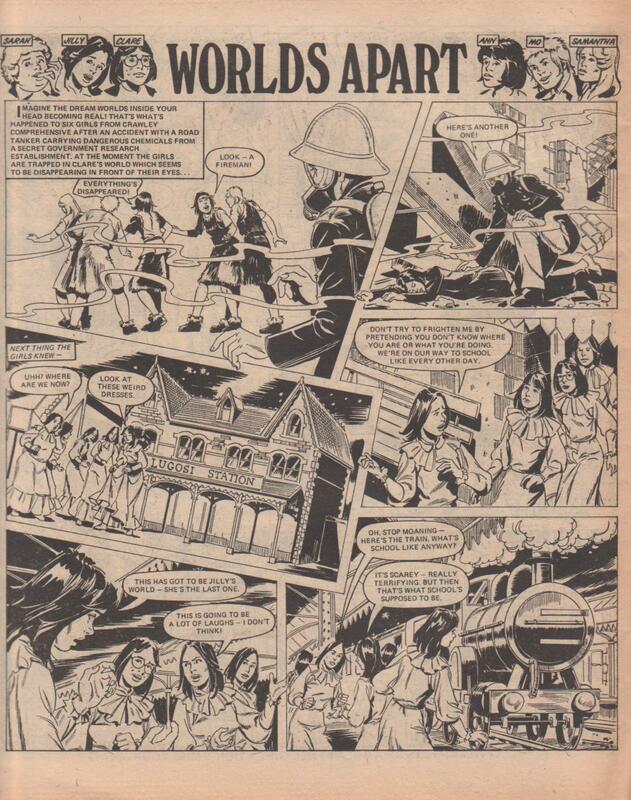 There is no lack of Extreme columns for the last story: if you’ve read Mistyfan’s summary of “Worlds Apart” you will know it is going to be possibly the highest-scoring story in all of girls’ comics. The protagonists are no big deviation from the standard, apart from the fact that in each story they seem to gain considerable status and power; but boy are the schools that they go to in each world not half odd! Their agency is taken away, their mental capacity affected as they each take turn to lose their memories and, most striking of all, they die painful deaths – not just one death happening in front of the reader, but over and over again. Physical laws and real-life historical facts are overturned without compunction, the girls are given physical attributes both greater and lesser than the norm, their emotional and mental security is played with almost as much as their physical security; but still it all happens within a brief timespan in our own present time, and in a reasonably circumscribed location. Yes, it’s bonkers – but it’s not all bonkers. I doubt I will be working through all the Jinty stories giving them WTFometer scores, but I’m sure I will come back to this another time. I would be very glad if others wanted to try it themselves; I have the grids available as spreadsheets that I will happily send out on request. I wanted to come up with a good way of looking at some of the stories we’ve been describing, in a more structured fashion – something that would help me compare one story with another, or the early part of a story with the later part, or even the stories in one comic with those in another. Specifically, I wanted to be able to pinpoint the ‘WTF’ feeling that is so prevalent in reading these stories nowadays as an adult – is there a way I could sensibly talk about one story being more bonkers than another, and about the way that it is sublimely ridiculous? To do this, I settled on looking at how far both the protagonist and the situation that she finds herself in during the story differ from a sort of assumed default average, or ‘platonic ideal’. I made up a structure of what that average reader of the time might look like: age, gender, family situation, social situation, and so on. This then gives a baseline that the comparison can be made from – we can ask, how far does the individual story (or story episode) take us from that baseline? And we can then compare the story that is set in something very like an average situation, with one or two key differences (the cruel stepmother, the emotional abuse) to the one that pushes the same themes further (torture and near-death), or to the one that pushes into weirder territory (mind-control, time-travel, alternate universes). Of course, this ‘average’ is an artificial construction – there will have been many readers that were different from this default. Neither is it intended to elevate one option above others – certainly not to say that the white English average girl is more ideal than the non-white non-English counter-example. I also can’t say that I’ve got that assumed average correct, at this inital stage; I’d love to hear people suggest changes and fixes to my first structure. I am however already finding it an interesting way to look at some specific stories, and to compare them on a much more like-with-like fashion than would otherwise be the case. Finally, a word of warning – this analysis has nothing to do with psychological realism, or with quality of writing. Literary fiction shows us that writing about people like ourselves, living in situations like our own, can be written well or badly, making for exciting or for dull reading. I am definitely not saying that a story in which characters are more like the default average reader is necessarily going to be a boring story. What, therefore, are the details of the structure? I have divided it up into 6 parts. What is the background of the protagonist? What is the underlying social/family/friends situation of the protagonist? What sort of free will or agency does the protagonist have? Realistically, a girl in 70s Britain is going to have various constraints; no one has an entirely free will to do exactly as they like. At the same time, those girls will still have some normal, expected freedoms. In some stories in Jinty, these basic freedoms may be either massively reduced (in a slave story) or increased (perhaps if the girl is a loner or an orphan). Is the protagonist reasonably safe and secure, or endangered? 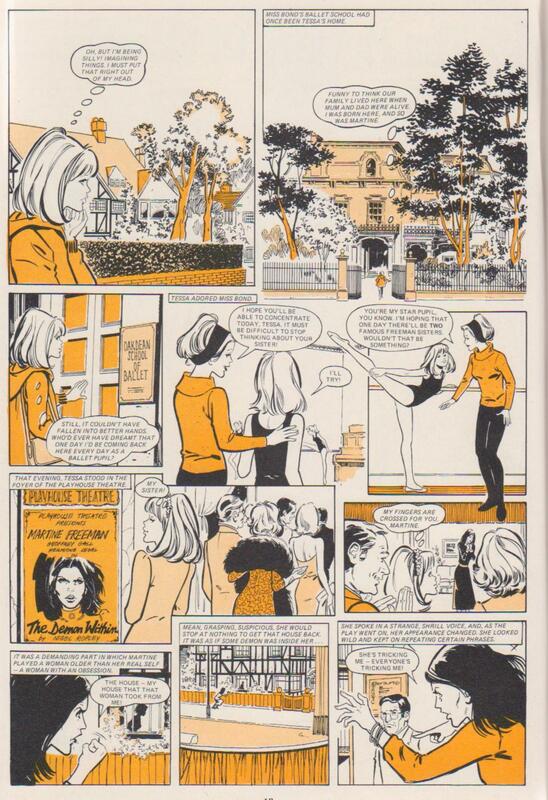 Most girls in our default 1970s Britain will have an expectation of being normally fairly safe; they do not live in war zones or go about in danger of their lives. Individuals may suffer bullying or have mental health issues such as depression, but this is not part of the expected ‘default’. What abilities or talents does the protagonist have? The ordinary reader isn’t a top cyclist, concert piano player, or even consistently head of her class. Now we’re really entering the realm of the fantastical. Of course no real readers could be from the future or the past, or travelling outside their own time. The above will be of little real use without examples, and it’s only the examples that will show whether this whole analysis is pointless or not. This post is already pretty long though, so the examples will follow next. This is the 101th post on this blog, and I used it to bring one of my favourite Mario Capaldi Jinty covers. 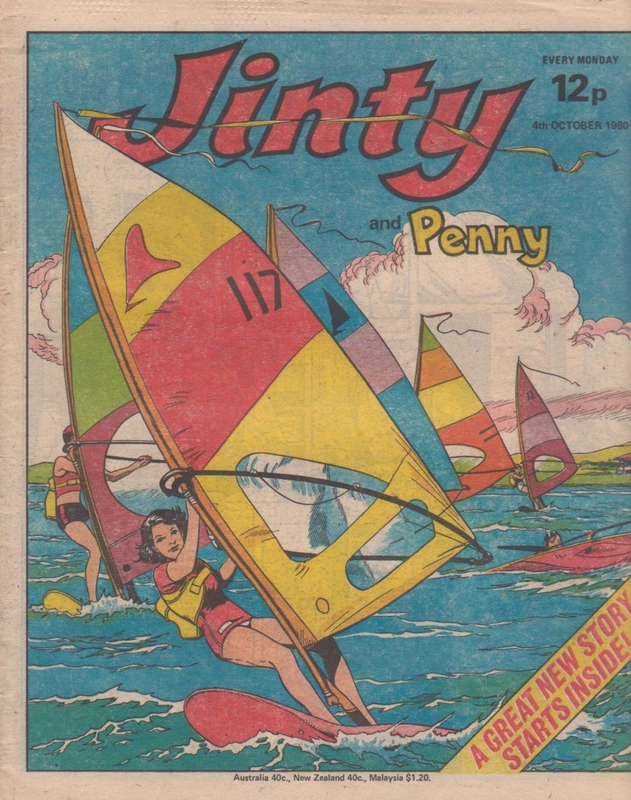 I find it to be one of Jinty‘s most uplifting Capaldi covers, with its use of colour, the symmetry of the sails, the ocean setting, and the slight humour of one rider having a mishap on the far right. The pennants trailing across the Jinty logo are a nice elegant touch as well. Inside is the beginning of José Casanovas’s last Jinty story, “Sue’s Daily Dozen”. Newcomer Sue Baker is a shy girl who has just moved in and having trouble finding her feet. Then she finds her cottage holds a secret – it used to belong to a witch and her collection of spells known locally as the Daily Dozen. But no – there is nothing evil or Satanic about it. It is how witches really were – wise women who tried to help people with magic and herbal remedies. The locals realise this and they embrace the Daily Dozen instead of fearing it or persecuting Sue for it. That’s what I really like about this story. In “Tears of a Clown“, Kathy has failed to prove her worth again. This time it is fate rather than bully Sandra who foils her. But you know the story is peaking and the resolution is coming, because in this episode Kathy is pushed too far when she is humiliated on Sports Day instead of getting the respect she worked so hard for. The blurb at the end tells you she will use her talent to run off next week. So readers are all eager to buy next week’s issue for that alone. In “Girl the World Forgot“, Mrs Owen begins to wonder if Shona is alive after all. Pity Mr Owen dismisses it instead of following it up, because Shona is indeed alive and marooned on an island. Meanwhile, Shona continues with hard lessons about survival, such as how to make clothes out sacks. But she has some fun in this episode by taking dips in the sea and enjoying her new seal friends. And in “Child of the Rain”, Gemma is learning yoga to keep focused on tennis. But yoga is no match for the strange power that causes Gemma to be filled with strength when it rains, but wilt like a flower when rain is absent. This is interfering not only with her tennis but with her life in general. I’m both amazed and amazingly pleased that this blog has hit the 100th post already – just over two months from the first post. Much of the kudos for this has got to go to co-writer Mistyfan, of course, who has written many posts about individual stories and issues, and who has been able to supply many scans that I’ve used along the way too. It’s been really motivational for me to know that there’s been someone else out there just as interested and passionate as me, but even more active, asking me when I plan to finish a certain post, story, or interview. It also looks like there’s starting to be some fruitful collaborative discussion on the blog comments, which I’m also very grateful for and would love to see more of. This is a good cue to ask readers what you would like to see more of (or, even, what you might want to see less of!) I am planning one story post to come quite soon, and thereafter some more on individual creators and on issues. My next few posts, though, are likely to be about analytical ways of looking at stories from Jinty and other similar comics. I hope that these different ways of looking at stories and issues will help to show what it means to say a particular story is bonkers and extreme, and will give some structure to ideas that Jinty differs (or is similar to) from other comics in this way or that way. At the same time, I expect that Mistyfan will continue to feed us on story posts and issue posts, the staple of this blog. Please do comment, though. Is there a particular story you are intrigued about and would like to know more on? Or one of the Jinty creators you want showcased sooner rather than later? Or some change in the frequency of posting, the way we structure the posts, the way the site hangs together, the way you can or can’t find material? I’d really like to know. And of course – many thanks go to you too, for reading!